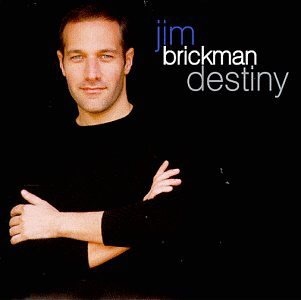 The nineties were the beginning of a phenomenal and impressive career for Jim Brickman and by the look of his tours, cruises and album sales, he's still going strong. The gifted pianist has traveled around the world romanticizing beautiful music and wooing audiences for decades. Back then I was fortunate to hang out with him during a few listener appreciation parties and concerts. He is just as nice as you would imagine, probably more so; and conversation with him is easy and relaxed. His voice is smooth, his eyes captivating and his geniune warmth is as cozy as his Christmas album. Destiny album release date January 26, 1999. Jimmy, (l call him Jimmy because in my mind we're completely casual) is America's New Romantic Piano Sensation. Jim Brickman touts his title during his concerts. This nomenclature started as a reliable quip to warrant audience laughter, but the tagline stuck because, he IS a romantic AND a piano sensation. On July 7, 1999, Jimmy (see I did it again) had a sell out concert on Chicago's Navy Pier. The pavilion was sheltered but open to the outdoors. It was a beautiful summer night for a concert. I was thrilled to have a ticket and enjoy his incredible performance. Brickman was brilliant as ever but what made that night so special was for an entirely different reason. My future husband and I flew to Chicago under the pretense that we were going to see Jim's show, go to an after party, then meet some new artists the next day. Looking back, I'm stunned that I had no idea what was coming. We arrived to the venue early (as usual) and grabbed our press passes and headed back stage. Jim was there and his lovely songbird companion and dearest friend since childhood, Anne Cochran. They welcomed both of us with a big hug and ushered us into a seating area as if we were in their living room. They were delightful and charming and I remember thinking, *Wow, I am in awe of these talented, gifted people. They are famous, but their Ohio roots have kept them grounded. * Being with them was as comfortable as hanging out with your closest friends from high school. Anne Cochran has a gorgeous smile, a friendly laugh and she's one of the easiest people to get to know. She is relaxed which makes you feel at ease while she tells you about her family or something funny that happened on the road. She's lovely. If you ever have the opportunity to shake her hand and tell her that her voice is enchanting, please do so. She will make you feel like you are the first person to ever tell her. My boyfriend and I had some time to kill while Jim and Anne prepared for the concert, so we took a stroll along the pier. The breeze off Lake Michigan was just enough for me to ask him to give me his sports coat. He blinked. Swallowed a little harder than usual, then slowly took off his blazer. Later, he would tell me that in that moment he hoped I would change my mind and decide I was warm enough. But I stood there, my head tilting to the left like the RCA dog listening for a reason as to why it was taking so long to get his coat on my shoulders. But what you don't know is that in his right coat pocket was a box. And in that box was a diamond ring. This was the same box and ring tucked inside his carry on when he freaked out because the flight attendant took his luggage and put it fifteen rows back in an overhead compartment. She explained that it just would NOT fit underneath the seat in front of him. The same box and ring that were hidden in his bag and placed on the conveyor belt as we passed through security. The yawning TSA lady stared at the black and white monitor with dull, bored eyes until she saw something circular and platinum showing up on the X-RAY. Now her wide eyes flashed bright as she shot a look to my guy. He was stoic and his face revealed nothing. She smiled and told us to have a "very nice day." Seriously, WHEN. DOES. THAT. EVER. HAPPEN? Back on the pier, his coat warmed my shoulders and covered my bare arms. I settled in to walking beside him. I wrapped my hand around his pinky finger (my way of holding hands) and we enjoyed the carnival-like atmosphere - the ferris wheel, the seagulls, the parents getting balloon animals and cotton candy for their kids. It was a perfect, memorable night, just as it was right then. It was time to get settled into our seats and savor all of our favorites songs. It was Jim's Destiny tour and still one of my favorites. If you haven't heard this album then do a search on Itunes as soon as you finish reading this Famous Feathers story. Jim was captivating and effortless with his talent. Anne joined him for a few songs and they were as kismit and intertwined as long-time friends and professionals could possibly be. After one of their songs, their playful banter charmed and the audience responded with laughter and applause. Anne, said "You know, Jim, we have some really special friends of ours in the audience tonight." Jim nodded and said "Yes, we have." as he kept playing a melody on the piano. Anne continued, "Jim, these friends have a favorite song of ours and I think we should play it for them now." Jim said, "Yes, we should do that, but I think he has something he wants to say first." Anne Cochran & Jim Brickman backstage. I'm staring at Jim and Anne, completely enthralled with their vocals and the magic they were creating. Even though I had no idea who they were talking about, I was mesmerized as was the entire audience. They paused and smiled and I'm smiling back at them unaware that the love of my life had slipped out of his chair, was down on one knee, box open, ring sparkling looking at me, waiting for me to notice. When I did, I gasped and slid down on to the floor with him. I was on my knees and I was holding his hand. He said, "I want to spend the rest of my life making you as happy as you are making me right this minute. - Will you marry me?" I was already crying and the spotlight was highlighting my shiny, wet face but I didn't care. I loved this man, this ring, this concert and Jim Brickman. "Yes! I cried, "Yes!" The crowd went wild with approval and as their applause settled, Anne smiled and walked back to the edge of the piano. Jim offered his congratulations and together they sang, "Destiny." We will cherish that night for as long as we live. The entire experience was pure magic and transcending. It felt like all of it was just for us. It seemed as if we were the only ones hearing "our" song on Navy Pier that night. Jim and Anne, You gave us a gift that can never be repaid. After 15 years of marriage we still consider your concert the start of our beginning. Someday, we would like to say thank you by having you as guests in our home. We would enjoy great wine, dinner and conversation into the wee hours. Someday, maybe you would be kind enough to join us for a ceremony to renew our vows - no performance required. Many blessings on your continued success.